How many of you, at the beginning of your college year, convinced your new roommate that you would always keep the room clean because of your self-diagnosed “OCD”? Or how many of you, envious of that one skinny friend of yours, said you wished you were anorexic? I’m sure some of you did…but I also hope most of you didn’t. Because there’s so much more to having an Obsessive compulsive disorder than just liking your things neat and tidy and there’s so much more to having anorexia than just staying skinny all the time. 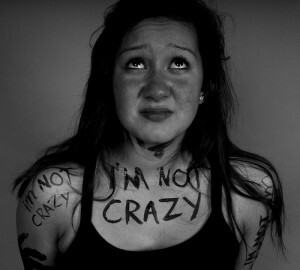 People with real disorders go through real problems, most of them are not even under their control. But the thing is that we use mental illnesses as adjectives for ourselves or sometimes others so loosely and so casually that we completely ignore their existence or that these still remain severely serious issues. According to a report released at the beginning of this year by WHO, 7.5% of the Indian population suffers from mental illnesses, which is over 90 million people who are going through various mental health problems. If we take in account the undiagnosed, uninformed part of the population, the figures would take a drastic leap. This means that while you’re going off about how the upcoming exams are totally “depressing” you to the 20 friends you have, there’s probably one of them for whom this is a reality, which you as a negligent mind just stomped all over. There’s already enough stigma around poor or unstable mental health in India and we certainly don’t need any more of it. While your failure to sleep through one night because you were dreading the exam tomorrow made you an “Insomniac”, people who go days or weeks without getting any sleep are hiding the hollows under their eyes and are afraid to actually go out and seek medical attention because when people tell them that “it’s okay”, “just close your eyes and count the sheep”, they’re made to believe that their situation isn’t serious or valid. Throwing a casual “You’re so bipolar!” at your friend might make people laugh for a while but what’s important to understand that there’s a vast difference between a person having a change of mood and someone actually being bipolar. Going through something as frenzied as Bipolar disorder is not close to you changing your mind and deciding to stay home instead of going out. 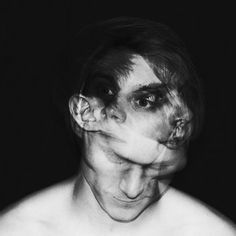 A person experiencing episodes of Bipolar disorder tends to go back and forth between feeling completely down and mania, a feeling of extreme high. Similarly, going through depression is not just feeling sad for an hour over the disappointing ending of your favorite TV show, it’s losing complete control of your interests and connection with the outside world. So next time before you’re nervous to go on stage and claim that you have anxiety, think twice, you’re belittling someone’s serious condition. You might proudly tell someone how your OCD kicks in every time you look at an unorganized cupboard, or feel sad about a celebrity breakup and just casually throw in the term depressed to define your mood. But here’s the thing, each time you do one of those things, it makes you and the people around you believe that these conditions can be categorized as valid/invalid, positive/negative, acceptable/unacceptable. By categorizing mental disorders, we’re glorifying some disorders like OCD or Anorexia and making disorders like depression or anxiety unacceptable, all of which leads to victims of these illnesses to stay quiet and never talk about their struggle because what would the world think? In reality, the thing is that each mental disorder is equally important, valid or acceptable and that there is no positives or negatives to mental disorders. 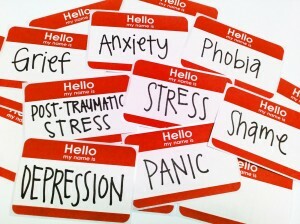 Having a poor mental health is common in our country but talking about it is not. The thing is that if people don’t stop referring to mental illnesses as jokes, those who really need help might never step forward because of a constant fear of being laughed at or ridiculed. People are afraid to go seek help because they’re too worried about what the society would think. Hiding a problem never does anyone any good but people are forced to think that their mental condition will be joked or frowned upon and therefore must be kept a secret. What this does is only brood the darkness which feeds upon one’s insecurity and doesn’t shy away from leaving them hollow. What we actually need is to sensitize ourselves toward the victims of these mental problems and encourage and inspire them to lead a better, healthier life and talk about their problems. It’s very important for us to make sure that when someone does come out to the world about their problems, we support and help them. Now everything you’ve read up until now comes to this, a person is not defined by their disorder, it’s not who they are. 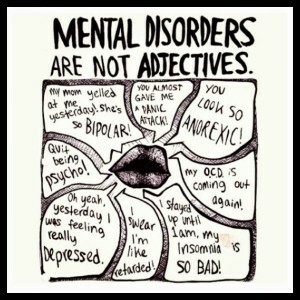 Their disorder is a part of them, but when we use mental illnesses as adjectives in our daily speech, giving it new meanings, reducing its importance and helping create a stigma around it, we’re making the victim believe that they are a part of the disorder when there can be way more to them. Ignorantly or casually misinterpreting the meaning of having a real mental issue adds to it being misunderstood further by others. If a person opens up about the chaos in their head or not depends on how we interpret and understand mental illnesses, if we fail to take them seriously, we fail as anchors to those in need of help. So watch your tongue the next time you’re about to say you’re depressed over a hard set of questions, words hurt, you never know who’s reality you’re squashing. 7 ways to pamper yourself using baking soda! 6 things you need to know about fasting during Ramadan.